It’s a little difficult to understand just how many more hotels can be squeezed onto Sanya. It’s a conundrum that has, in no way, dampened the enthusiasm of hoteliers for the island, much less its scenic south and powder white beaches. 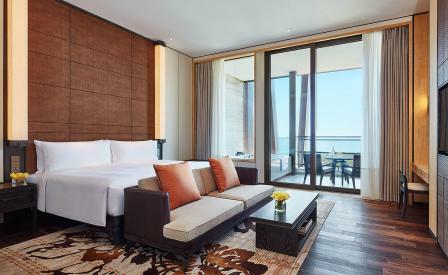 Case in point: the official unveiling of the new Edition is a couple of weeks away, but just down the same Haitang Bay beach, the Grand Hyatt is stealing a march on the competition with a quiet opening. Interior architects LTW have built the 435-room property around the idea of a modern fishing village. Which is to say that the aesthetic nod to the island’s aquatic community is a mix of colourful ethnic touches, woven textiles styled after the native Li tribe, and natural fibres that has been worked into wall coverings, rugs and even the backs of low-slung chairs. The scale of the Grand Hyatt is impressive – a 190,000 sqm beach palace that includes three swimming pools, a seven-metre-high ceilinged ballroom, wedding pavilion overlooking the South China Sea, and no less than four restaurants, including Yu Cun designed by Andre Fu. Meanwhile, the vast Huan Spa features traditional Chinese medicine therapies, and facials based on hydro-mineral products made from Hungarian thermal spring waters and moor mud.